Dr. Srinivas Mukkamala, co-founder and CEO of RiskSense, gave a keynote speech on Oct. 5 about cyber security. 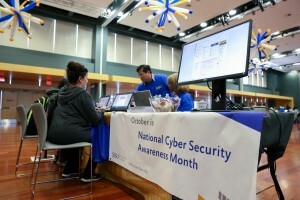 San Jose State University has joined with the U.S. Department of Homeland Security and its partners across the country to highlight the importance of cyber security and online safety as part of National Cyber Security Awareness Month. See tips in this month’s ITS Security Newsletter. DHS has created a site with tips as part of its public awareness campaign Stop. Think. Connect. SJSU’s continues to be a primary educator of future cyber security professionals and is strongly involved in research around the industry. The university has been designated by the U.S. Department of Homeland Security and National Security Agency as a National Center of Academic Excellence in Information Assurance/Cybersecurity Education through 2019 and is home to the Silicon Valley Big Data and Cybersecurity Center. Dr. Lee Chang joined the center as its executive director in July and has been cultivating an environment of multi-disciplinary collaboration with faculty across the university in three critical areas: program development, teaching, and research. Lee will take the lead in defining a vision and direction for the Center to become a national and international leader in cybersecurity and big data. “Many of us at CIES have worked with Lee and appreciate his “can do” attitude and entrepreneurial spirit,” said Ruth Huard, dean of CIES, when she announced his appointment. 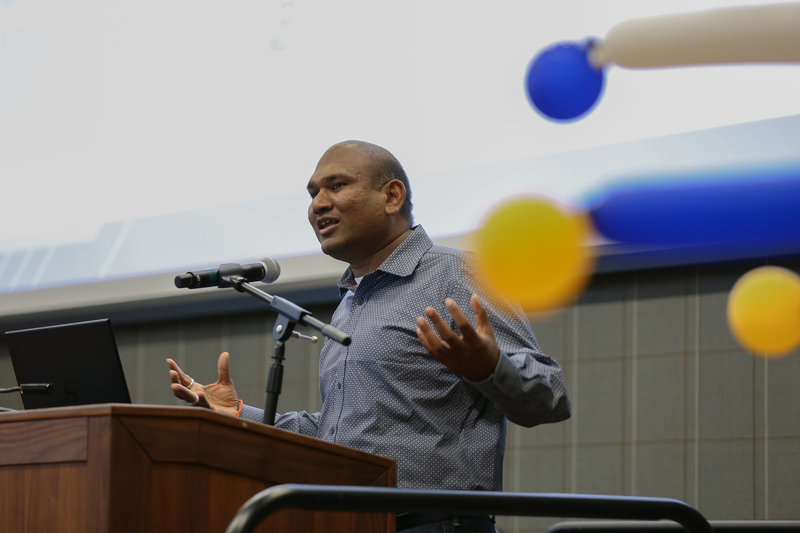 At SJSU’s Innovation and Collaboration Expo, Dr. Srinivas Mukkamala, co-founder and CEO of RiskSense, gave a keynote speech on Oct. 5 about cyber security. His keynote shared insight into the ways response to cyber security of changed as technology evolved as well as thoughts on where the future of the industry is heading. Mukkamala has been published in more than 120 peer-reviewed publications in the area of information assurance, malware analytics, digital forensics, data mining and bioinformatics. He holds a bachelor in computer science and engineering from the University of Madras, India, as well as a master’s and doctorate in computer science from New Mexico Tech. He was one of the lead researchers involved in Computational Analysis of Cyber Terrorism against the US (CACTUS) at New Mexico Tech, New Mexico State University and the Naval Postgraduate School. The team was awarded a $5 million grant to develop a multi-agent system that would be able to conduct real-time analysis and monitoring of selected foreign language websites. In 2002, researchers showed how hackers could use a printer to break into a network, something that had not been considered a possibility in the past. As the “internet of things” expands with more everyday items such as cell phones, medical devices, cars and more connected to the world, he said network vulnerabilities continue to increase. “It only takes one entry point,” he said. Mukkamala holds the patent on “Intelligent Agents for Distributed Intrusion Detection System and Method of Practicing.” RiskSense provides a test of web applications for its customers that assigns a score of their vulnerability to cyber attacks using data analysis. “Our team is comprised of industry-leading cyber security experts, experienced application security engineers, and dedicated penetration testers who use their deep understanding of malware tactics, techniques, and the advanced threats to stop exploitation by hackers,” according to the RiskSense website.